Baby #3’s gifts also grew out of a silly idea on the part of his parents. Back before they got married in 2014, his mom & dad made a truly hilarious engagement video of them costumed as a penguin and a giraffe and dancing around Chicago. Obviously their child should grow up knowing that his parents are some of the silliest, cutest people in the world. Since they told me they were expecting a boy, I figured that he’d need to dress like a baby penguin to fit into his family. 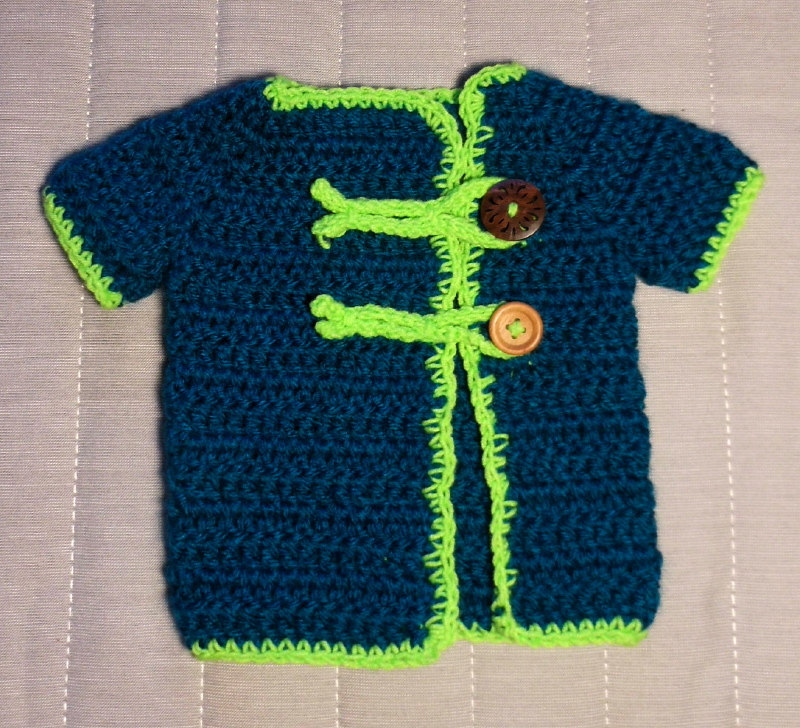 For the cardigan, I used the same pattern as baby #2’s green froggy one. 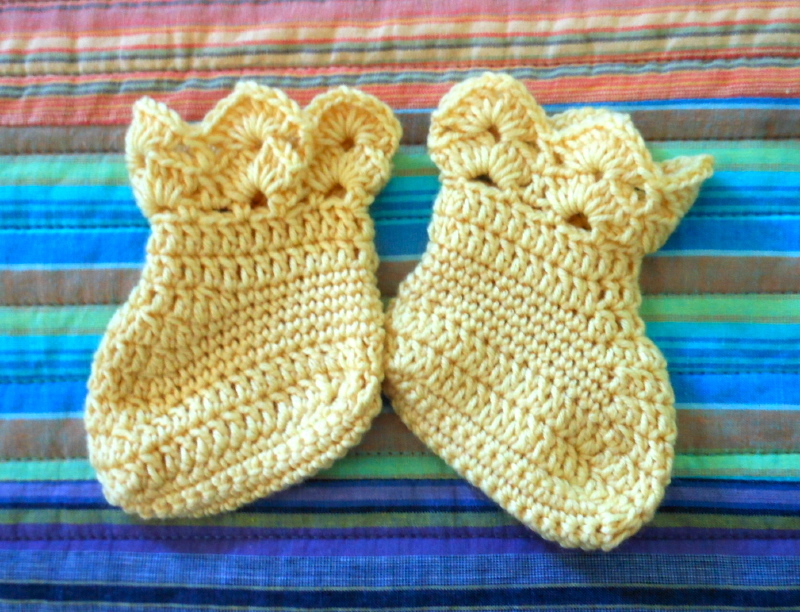 The little yellow booties (you can’t see it in the above picture of his parents, but dad is wearing ridiculous orange shoes too) came from this super simple free pattern. That hat though… oh dear. Baby #3 would have gotten his presents so much earlier if I hadn’t set my heart on free-handing a color-worked baby penguin face hat. …I thought finally had something satisfactory, until I realized it was far from baby sized. Thankfully, making a second hat was so much easier. Not only had I figured out how to pattern the color work, I also made the smaller hat by holding two strands together and using an I hook instead of the F hook I used for the bigger hat. SO MUCH FASTER! I wanted to make sure that giraffe-mom wasn’t forgotten either and totally lucked out by finding a giraffe blanket at Target. I free-handed the frog hat (taking inspiration from Frogcat clearly), and then used a free pattern for the cute little cardigan. 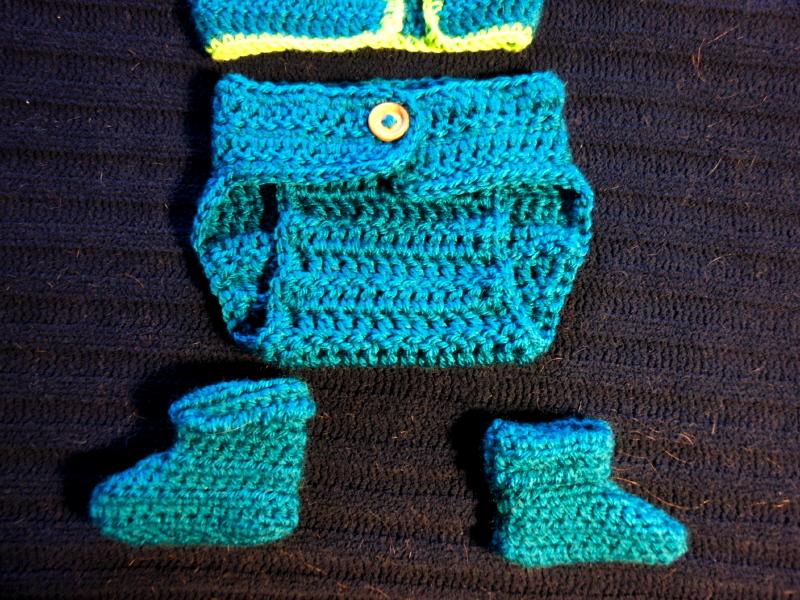 Since I put little feet onto the ties of the hat (I imagine it’s a whole frog sitting on Baby #2’s head like a helmet), I didn’t make booties to go along with this set. 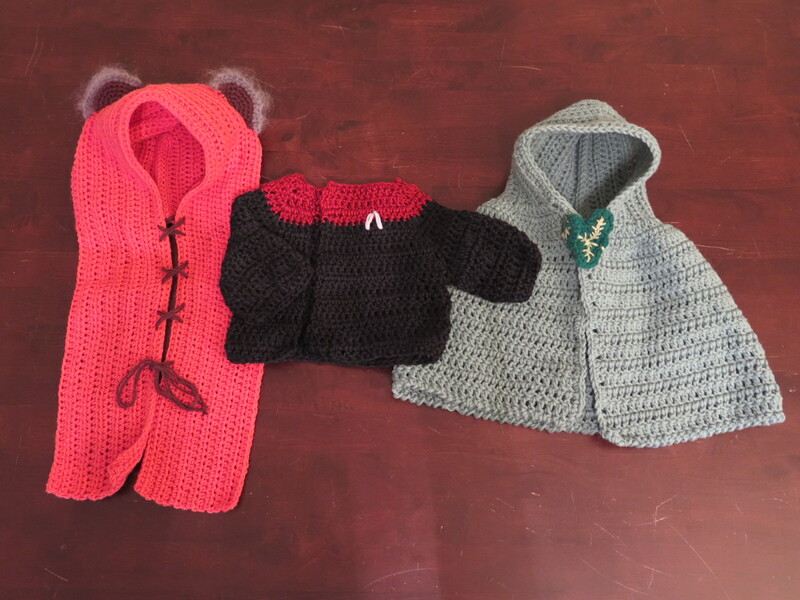 Obviously, I didn’t want Baby #2 to grow up thinking that I believed they were just a frog, I made a couple of other things. And finally, I took the chance of to finish up a baby blanket project I’d had sitting around, in pieces, since 2011, and get it out of my UFO stash. The white cotton came from an unraveled sweater I got at a rummage sale forever ago and used in some other projects over the years, whereas the gray/blue cotton came in that huge stash of yarn that a friend of my mother-in-law’s sent to me a few years back. Baby #1 got the simplest gifts, not because I love her mom any less than any of my other friends, but because when I checked in with her parents, it turned out she already had lots of people pledging to make things AND my friend had some disturbing memories of some horrid crochet dolls from her childhood. Alright then, I won’t argue with simple and easy! Having already made three grownup pink cat hats in January and February to send off to friends and family, it seemed right to make one for this little girl too. I recently just heard back from my friend that she sent her daughter to daycare wearing the hat on “homemade hat day” recently and it was a hit with the carers, so I count that as a serious win for all involved. 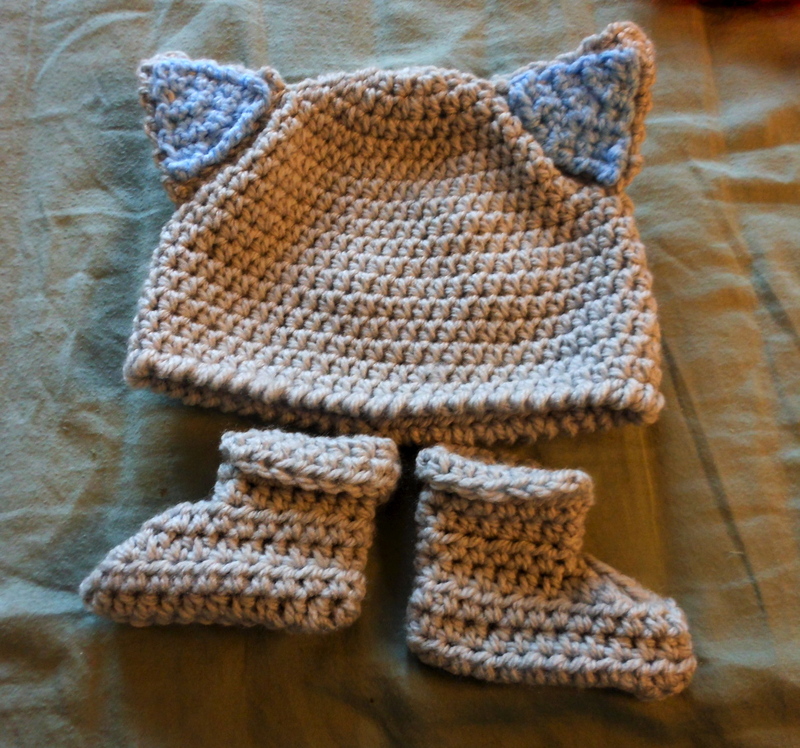 The measurements for the baby cat hat are 8 inches across, and 7.5 inches from the top to the edge, by the way. Rather than crocheting it flat and seaming the whole thing, as that pattern that went around online called for, I crocheted the crown in alternating rows of single crochet and double crochet until it was about 7.5 inches deep, then folded it in half and did the ribbing in the round (2fpdc, 2 bpdc) for another 3.25 or so inches. I used an F hook for this. 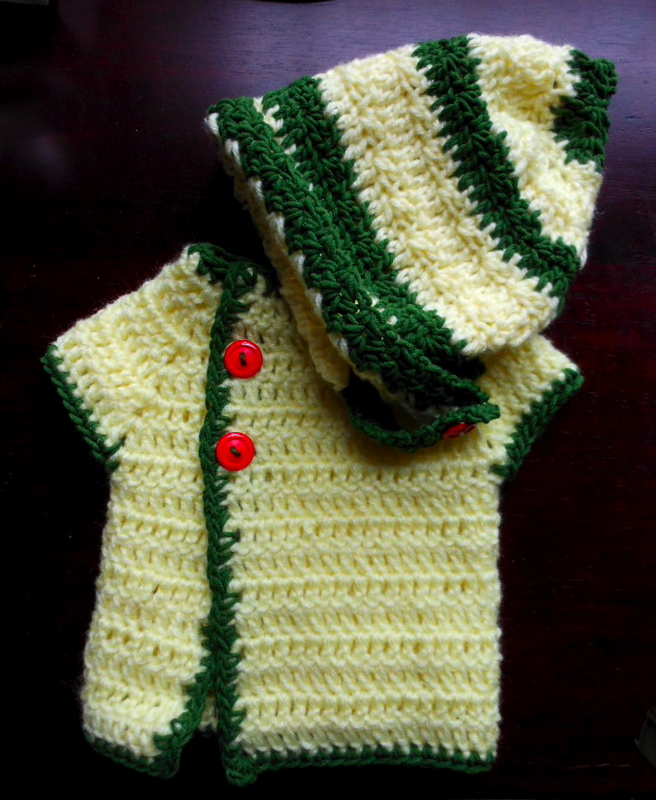 I also made a little vest for baby #1. The pattern is super easy to follow and I like that it let me use some neutral cream yarn and embellish it with a little bit of color. My marvelous cousins are having a baby this summer! One of our ministers at church just had a baby, so I took another break from the secret project and made her new daughter a little bonnet and dress. I seriously love the bonnet pattern. 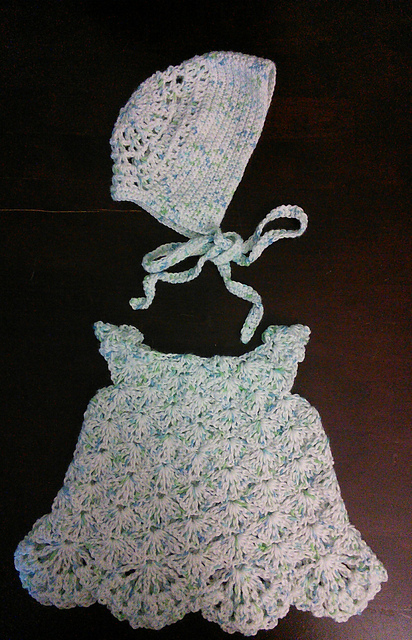 The dress pattern is fine and is a quick little project, but I still like the bonnet better. The yarn was not great – kind of splitty, but I like the color. Not sure what kind of yarn it was, it was part of a big bag of donated odds and ends and came without a label. More from the treasury of fancy yarn Gene’s mom gave me. Debbie Bliss Baby Cashmerino was a delight to work with. 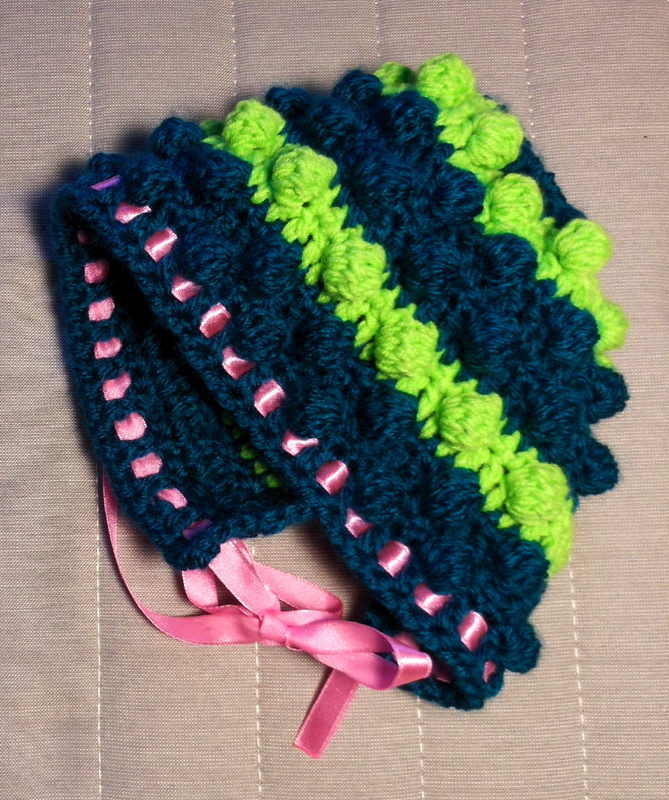 In contrast with the cardigan, which I’ll show you later, this bonnet and the booties were a lot of fun to make. Crocheting baby accessories usually provides instant gratification, which is wonderful when my large projects have stalled, but also just because the yarn was so nice running through my fingers. I finished them in mid-September but haven’t had the wherewithal to post about them until now. Hopefully this means I’m back to semi-regular craft blogging, however! This time for my mom’s neighbor’s baby and toddler. Older brother gets a dinosaur! 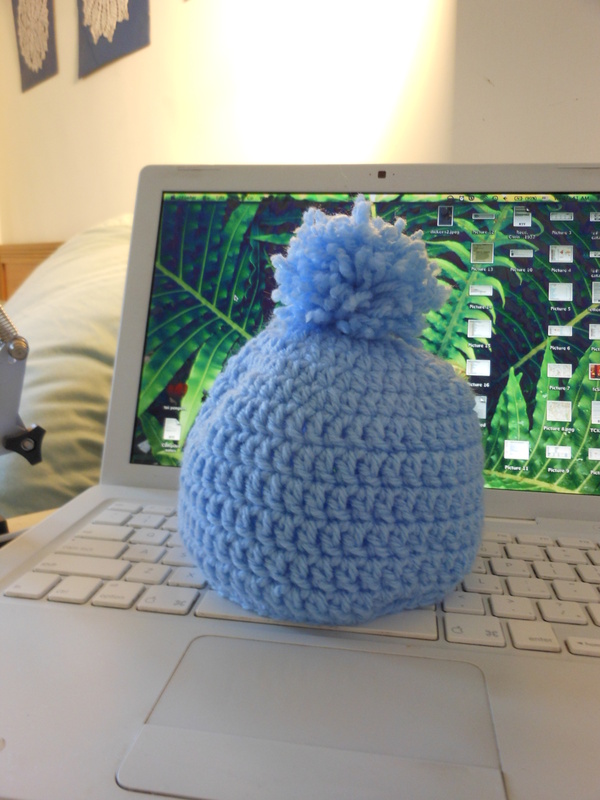 …and a bonus little pom-pom hat because I wanted to use up all the yarn I bought for these projects. All that’s left is some dinosaur green, but I wasn’t about to make a third hat, especially since the term “green hat” has negative connotations in Chinese. Now that my cousins have gotten the package with all these tiny, delightful pieces, I can share them with you too! I fell in love with this teal yarn when nearly despairing over all the ugly and boring yarn colors at a nearby stationery store. I originally just bought enough for the cardigan and booties, but kept going back for more until I’d made a matchy-matchy set in all different sizes! Good, because I think the poor child would be made into a bit of an eyesore wearing them all at once. You’ll recognize the neon green from two previous projects I’ve shared here. I’m down to the absolute last of that stuff! 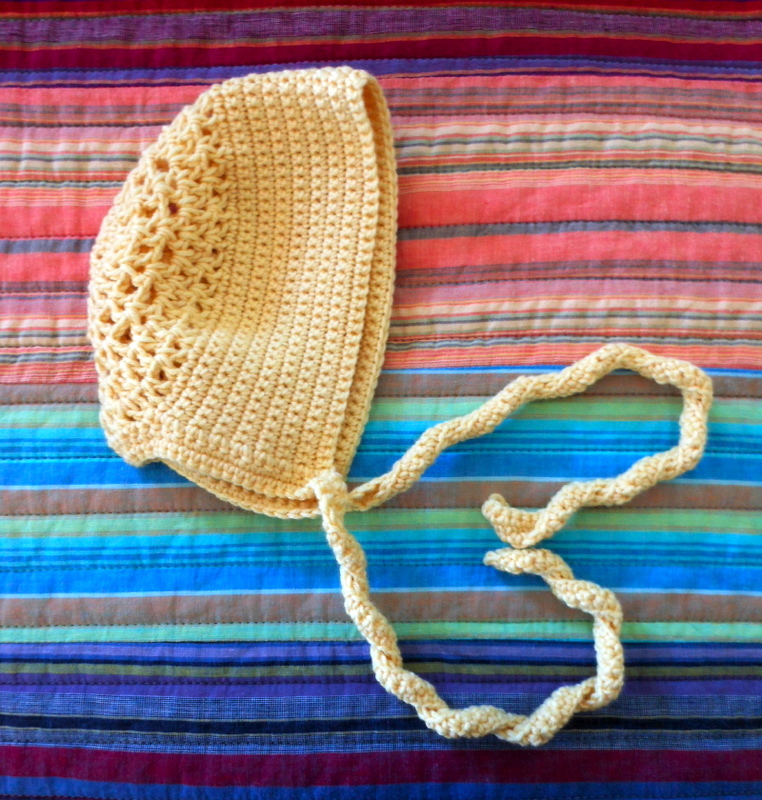 This bonnet was a personal challenge – not the making of it, as it turned out, but the embarking upon making it. Early on in my years of crochet, I tried to make some project that involved bobbles. I couldn’t make the stitch without frustration. I didn’t have the skill to smoothly work through all the accumulated loops on my hook to complete the bobble. So I wrote bobbles off and thereby avoided any pattern including them. What changed? 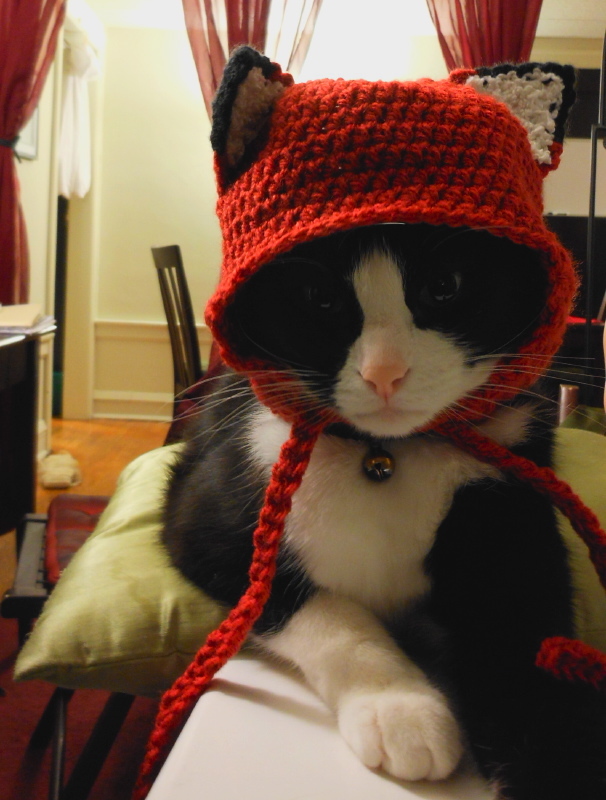 The photo for this pattern on Ravelry was far too cute and I thought I should probably give bobbles another chance. Glad I did! I’ve made a couple of these before. I love this pattern. I’ve also used both these patterns before, and they are both easy and satisfying to crochet. I found this pattern because I’m stalking my cousin’s crochet board on Pinterest, planning to make some of the things she pins for babies because I don’t imagine she has much time to herself to make them all. Once I get back to Chicago with the body of my yarn stash, there are a few other patterns I’ve found this way that I plan on making. 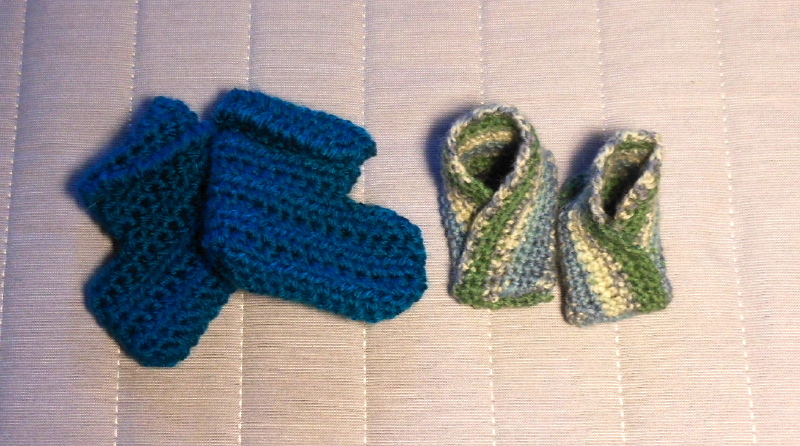 I’m attending a baby shower tomorrow afternoon, so when the announcement came out a couple weeks ago, I started thinking of what baby-sized things would be interesting to make so soon after the last set. With all my worsted weight acrylic committed to the granny square blanket madness, I looked through the few balls of DK weight acrylic in my stash for this baby present and came back with an orangey-red yarn as the most promising color. The parents, director of a center on campus and her husband, did something wonderful in their Amazon registry for the shower – it’s not at all clear whether they’re expecting a boy or girl. Considering the last time I saw them, it was at an interdepartment Halloween party and they were dressed as two members of the Village People – she was the construction worker, he was the biker – I’m not too surprised. I think tomorrow’s shower will be a lot of fun. First, I made a pair of booties from a pattern I found on Pinterest. You can find the pattern as a free Ravelry download here. It was when I started to work on a hat to match that inspiration struck. This color hat begged for fox ears. 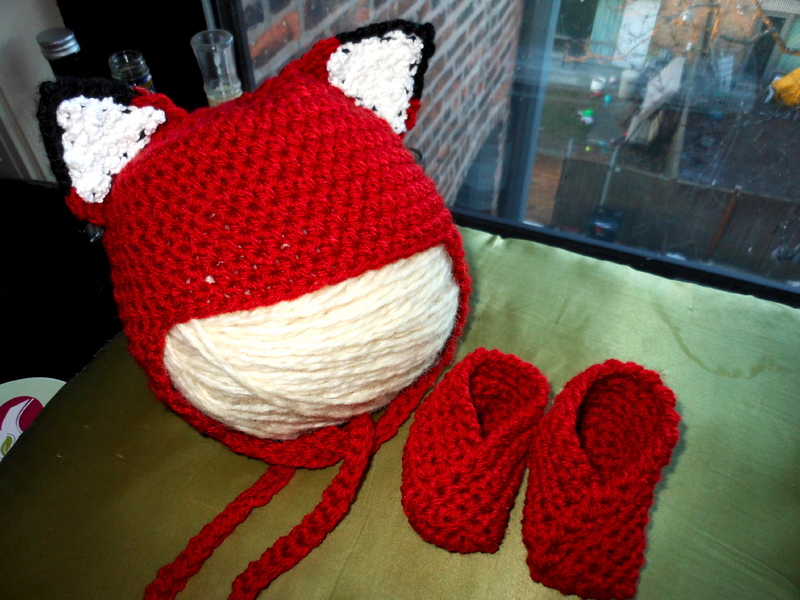 I spent some time looking at pictures of foxes online and exploring my stash of yarn. Some odd nubbly white my grandma gave me after someone gave it to her, which has been sitting ignored in my stash because I have no idea what to do with it, ended up being fantastic for the fuzzy inner ears. I had black Caron Simply Soft (which claims to be worsted weight, but isn’t) left over from something else. The whole thing turned out so well that it’s another gift I’m really excited about giving to someone. I love it! Bonkers, however, begs to differ. A graduate student couple in a department closely linked with my own had their baby just about a month ago. In English, her name is Ella, short and sweet, but in Chinese her name means something like “to utter the unutterable” – setting her up to be an international woman of mystery someday, I think. 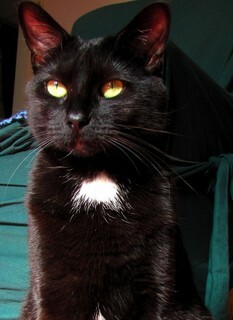 For now, however, she’ll just have to be content with being cute. Hat pattern via Sweater Babe. Vest pattern via Yarny Days.